As the opera singer told Salieri in Amadeus, "I love a man with talent!" (Especially when he is young and beautiful.) I don't know if Canova was beautiful, but he certainly had an eye for beauty. Isn't it gorgeous? Such creamy-white marble. So erotically charged and so tender. 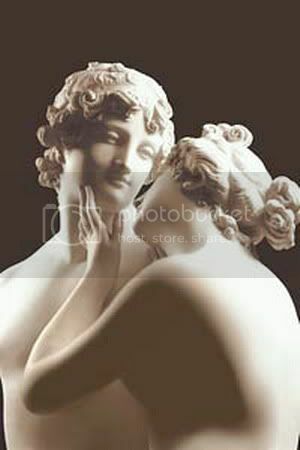 Look at the way Venus touches his face and the tilt of her head as she gazes into her lover's face. It looks as if she were one of us, gazing into the face of film Frodo, thinking with besotted awe, "Unbelievably lovely!" And what is Adonis thinking? He appears to me to be melting; perhaps he is thinking something along the lines of what I would imagine "my" Frodo would be thinging, something like, "Heavens ... I can't believe she is looking at me like this. I shall swoon in a moment. Thank goodness for fig leaves!" Thank goodness for fig leaves ..."
Yes, thank that Pearl. She's a good'un.